It all started when I saw a roll of a red tag golden damask. I knew exactly what I wanted, there was exactly enough on the roll, and I went straight home to come up with a design. 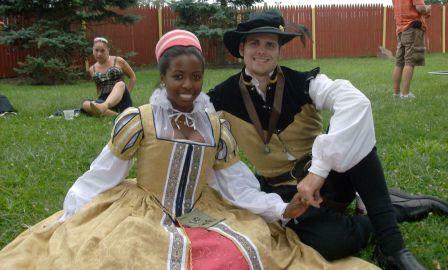 Due to various issues with previous undergarments, I started with a new corset and a low-necked smock. The smock will not get a journal, but there are comments on it and the corset on the “Corsets” page. The next list item was the forepart, for which I rescued a fuchsia embroidered silk in the remnant bin. It was a big remnant, and I believe there is just enough for the matching sleeves (currently drafted as open narrow sleeves). I already had a one-piece underskirt and forepart from the Maroon & Gold ensemble, so I decided to update that for space and sanity concerns. I removed the patterned tan forepart section and replaced it with heavy yellow linen. This was not an aesthetic choice, I simply did not have the patience to go shopping for more cotton. If anything, I could have pieced remnants together from the scrap box, but it would have taken a lot more time. On the upside, I found that the linen holds the forepart in place when the two are not fastened together. I will be using snaps to fasten the underskirt and forepart(s). The detachable forepart was simple enough to make in my sleep. Which is good, because I can make new ones to use up my random one yard fabric bits. Since the embroidery is pretty enough on its own, I have not planned any further embellishment. However, I did find a complimentary satin ribbon in purple that I may use for the sleeves. The silk is flatlined with felt, as I used it in a previous forepart and did not have enough canvas on hand. 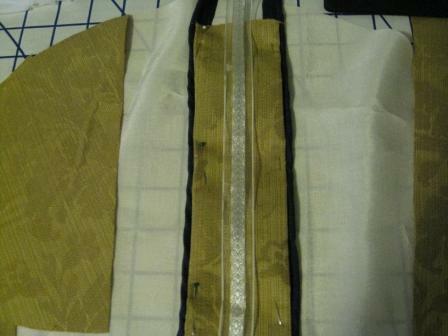 I used leftover green bias tape to finish the edges and white twill tape for the waist tie. I am going through a “let us use what is on hand” phase; luckily, anything that clashes [generally] will not be seen. Both the current forepart and last year’s forepart are seen here. 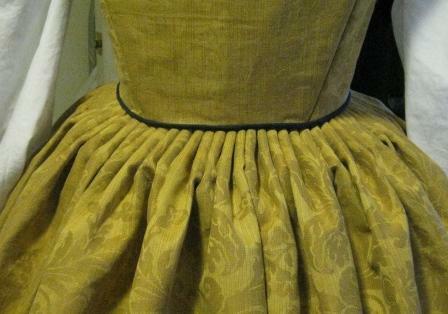 The overskirt consists of three unlined panels of the gold damask. I didn’t see a need for more panels, and I wanted to conserve fabric for part of a complimentary gentleman’s ensemble. The skirt does not have a waistband; I planned to attach it directly to the bodice, so I didn’t want the extra step of making one. This was my first experience with cartridge pleating, and I think it went well. 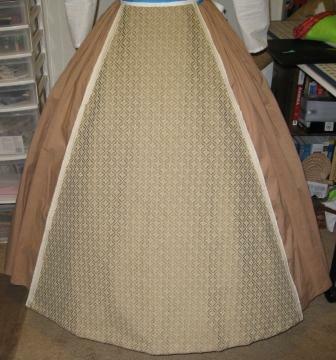 I lined the folded upper edge of the skirt with duck cloth backed gingham ribbon. 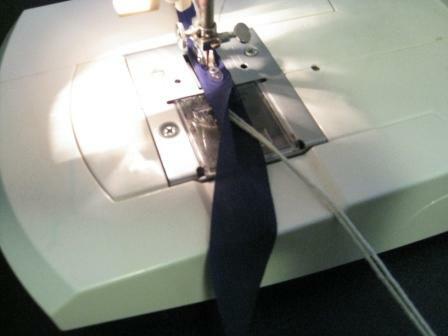 The ribbon made it easier to get even stitches for the pleats. I used carpet thread for the pleats. Once the bodice was finished, I pinned the skirt along the bodice bottom, matching the V, but the skirt wouldn’t lay flat in the front. I whipstitched the along the bodice waistline in the back and front, which fixed the problem. The bodice gave me a few sleepless nights, but nothing too awful. 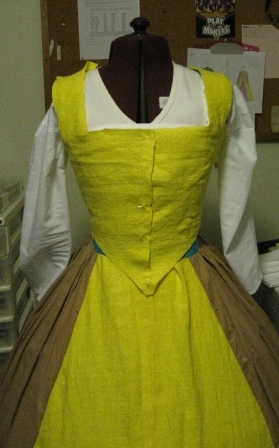 The bodice is layered [from the outside in]–gold damask fashion fabric, yellow heavyweight linen, blue duck cloth with twill boning casings. The duck layer was my mock-up since the linen has a tendency to stretch and go off-grain. 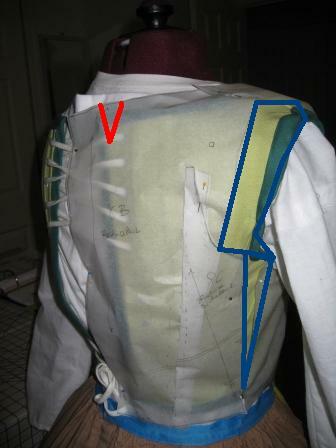 Aside from shortening the bodice, the biggest fitting problem I had was in the arm hole and upper back. I made a few additions to cover the rear arm hold area where the corset could be seen. 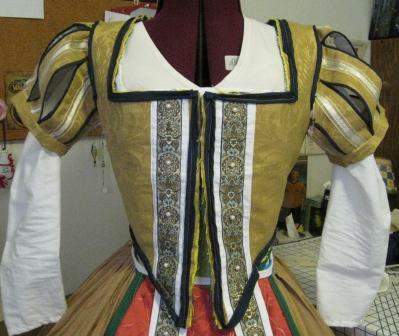 I darted the upper back to make the bodice fit snug. 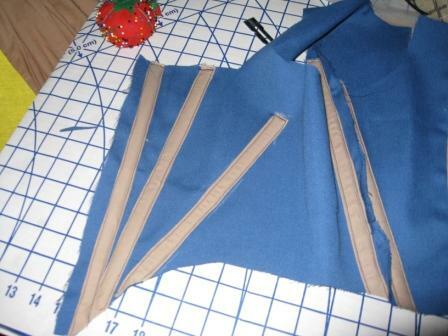 I also cut the bodice to a point instead of having a rounded tab. After all of the layers were cut, I added the trim to the front. 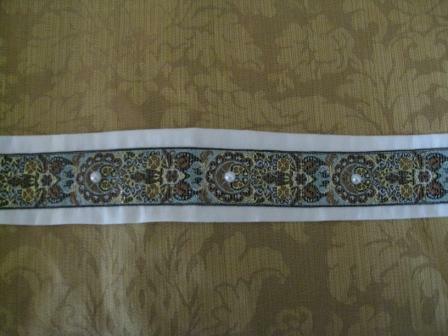 The primary trim consists of a white cotton broadcloth base and store bought trim to which I added plastic pearls. The trim has blues and metallic gold, and it’s quite busy. 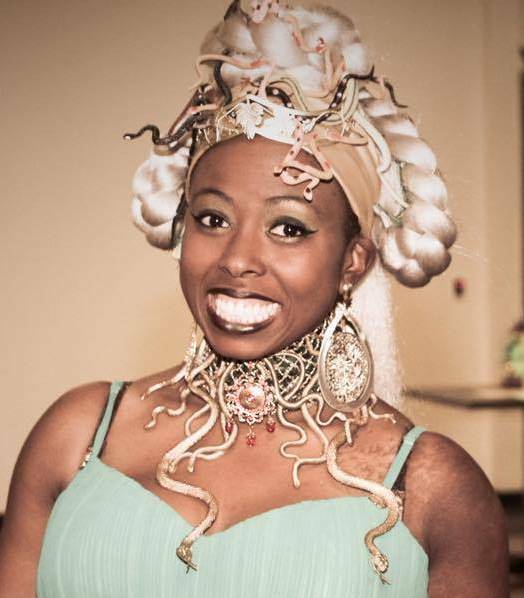 I originally used the trim in a Cleopatra costume, and purchased way too much, as usual. 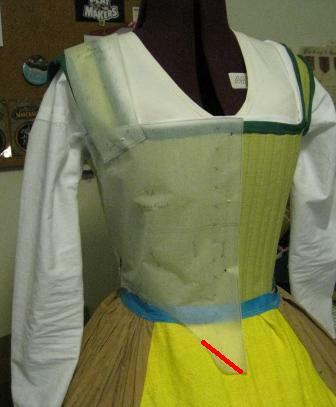 The bodice is boned with heavy duty cable ties. I flirted with the idea of using Rigilene boning to avoid any bones from “peeping” through, but I didn’t have any on hand. The bodice is piped on all edges with navy blue cotton broadcloth and cording, which is too thin for piping, but I made it work. Piping was another new experience, which took longer than it should have to understand. I sketched the gown with paned cap sleeves. I used the navy blue piping and a white and gold ribbon for trim. I chose an off-white thin fabric to show through the panes, and the pouf was stuffed with netting. It took a few tries to get the pouf to optimal puff, and when I got it there, it laid flat and a bit stretched. I think that cutting the pouf piece larger would have given the look I wanted, but I’ll have to remember that for next time. Instead, I created a stand alone set of panes and gathered the center pane with a few stitches to make it stand away from the bodice. 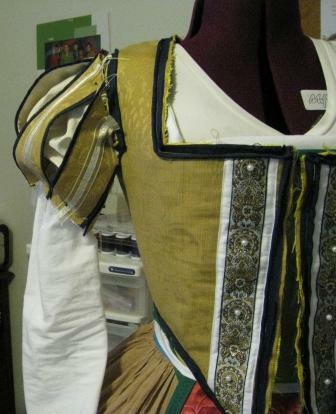 The sleeves are currently attached to the bodice, but they are wider than arm holes on the bodice. I will probably remove the cap sleeves and attach lacing rings to them. The plan is to lace the narrows sleeves through the cap sleeves into the bodice lacing rings. We’ll see how that goes. 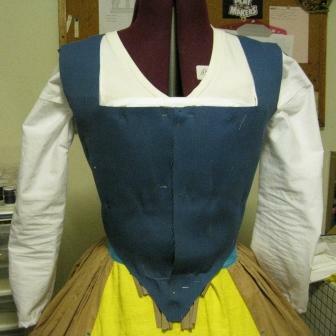 I attached the skirt to the bodice without much difficulty. 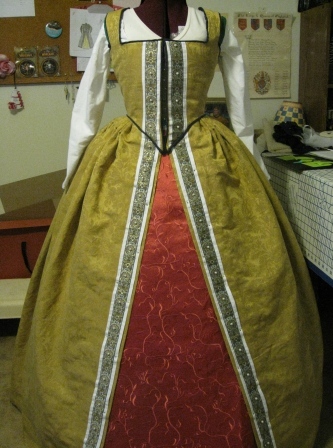 After the gown was in one piece, I matched and stitched the trim to the skirt. Then, I hemmed the skirt…only to find that the forepart didn’t quite match up. I added a bit of green and white trim to the forepart’s hem and turned it under at the same time. I then pulled a few matching pieces from the bucket of buttons and added some bling. 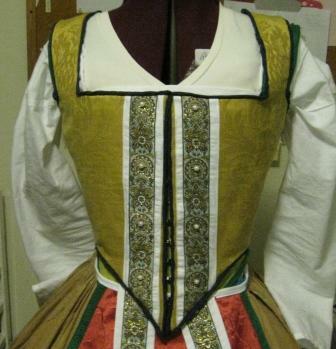 The bodice closes (after some patience) with hooks and eyes. However, it requires a pair of rolls at the front to close the gap. I think I made the bodice rolls more difficult than they had to be. They truly are just a pair of stuffed tubes. 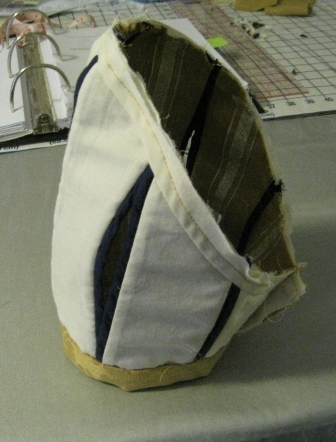 PWU: There was still gaping at the front of the bodice, so I made three temporary stitches along the rolls to keep anything from peeping through. I made sleeves from the rest of the forepart’s silk, and though some little mistakes were made, they still look like sleeves. 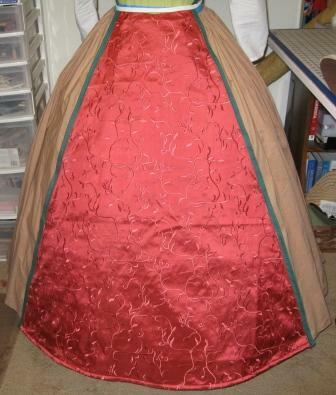 The lining is a bright coral color and I piped the opening with metallic gold piping, once used as cording for my Cleopatra costume. The only other decoration (I think I was tired) is a strip of white satin ribbon along the bottom of the sleeve, crossed by the purple satin ribbon used on the bottom of the forepart. As an after thought, I only have three button points in the front opening. I used braided embroidery thread for the loops and gold plastic buttons. The sleeves are okay, but I think I’m going to go with another style on my next gown. I thought the narrow sleeves would be more narrow, but they feel a bit bulky. After last year’s debacle with hats, I decided to give the pill box/round hat a try, since the shape is pretty straight forward. It turned out quite well. The base fabric is the pink silk, and the hat is lined with the same coral lining as the sleeves. I decorated the flat part of the hat in a lattice pattern of purple satin ribbon. Each intersection is bound with a pearl. White and gold ribbon circles the sides of the hat, and it is attached to the hair with a comb behind the point. I found that the best way to secure my varied length hair inside the hat was to make three small pony tails on the back of my head in an upside down triangle formation (inside the area that the hat would cover). I then secured each length of hair with bobby pins along the triangle to each point (pony tail elastic) in a clockwise pattern (forming the sides of the triangle). When the comb was pushed into position, the hat was secured perfectly, without any slippage for eight hours. At some point in the rush to finish this project, I managed to make my perfect smock (to replace the nightmare smock from the beginning of the project). This one was a happy marriage of the low and high neck smock patterns to allow me to wear my pretty, pretty parlet and still have big poofy sleeves. I found a beauteous white cotton/linen blend at the fabric store and couldn’t pass it up. I used dollar bin lace on the cuffs (no ruffle) and secured them with one hook & eye each and a length of sheer white ribbon. The smock is lovely, and very comfortable under everything. For jewelry, I decided on last year’s button rings and a new necklace (created out of sheer boredom). The necklace is a close fitting style made of jump rings and gold findings with blue crystals in the center. I found white enameled flower petal earrings from my childhood in a box, and they were perfect! On my feet, I wore a pair of blue, Asian inspired MaryJanes over gold, sweat-wicking, knee high trouser socks. Against my own will, I wore spandex under it all to reduce thigh discomfort. If I’d had time, I would have made bloomers. PWU: The dress was a hit at the PARF; I felt well integrated with the rest of the playtrons. There were no wardrobe malfunctions while the dress was being worn. During the car ride up, I raised the hem on the front panels of the skirt to even that with the forepart. After the faire, I noticed that a couple of the hooks & eyes had loosened their threads, but nothing major. Your gown is just amazing! 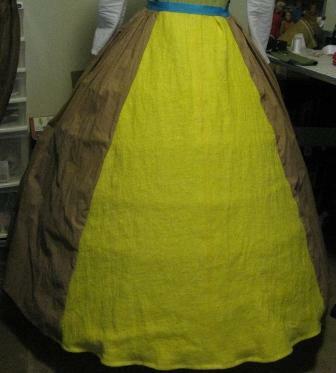 I love seeing how it comes together as I’m a bit intimidated at this point to attempt a noble’s gown. You do beautiful work!! Thank you! It has been quite a learning experience. One more week of work should pull everything together.